Mary Frank, before being taken by Adult Protective Services. Photo source. 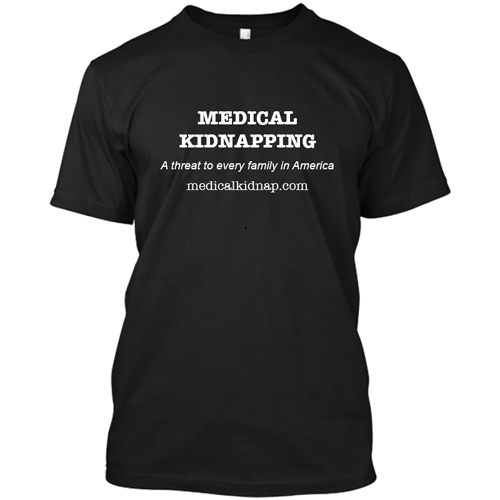 Boston is home to one of the first notorious cases of medical kidnapping that garnered widespread public attention, that of Justina Pelletier, seized by Boston Children’s Hospital and Child Protective Services, and confined against her will and the will of her family in a psych ward. 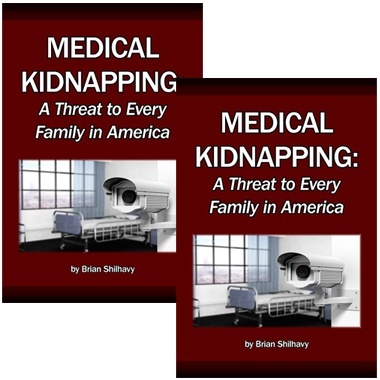 It appears that the Boston area is a hub for medical kidnappings of adults as well as children. In at least 4 cases that we know of in the Boston, Massachusetts, area, there is a web of common players who are interconnected. Jewish Family and Children’s Services is the common denominator for each of these senior citizens who were seized by Adult Protective Services. Instead of foster parents, “guardians” are court-appointed to take control of their lives, assets, and medical decisions, leaving elder adults victims of strangers they have never met, isolated from their family and friends who are the ones that truly care about them. They are accused of having “mental illness” and confined to psych wards against their will. Lonnie Brennan is the editor of a newspaper that has reported their stories, The Boston Broadside. He was recently served with a “No Trespass” order over the case of one medically kidnapped lady, Mary Frank, who was trying to reach out to him to get her story published. She was confined to a nursing home and psych ward against her will, and denied basic human rights. The people involved in holding her captive are apparently not interested in her right to have visitors of her choosing, or her right to have her voice heard. 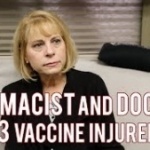 Mary Frank’s story is connected to those of Beverley Finnegan and Marvin Siegel, whose stories we have reported here on the MedicalKidnap website. You will read Mary’s story below. Alice Julian’s story will be coming soon. 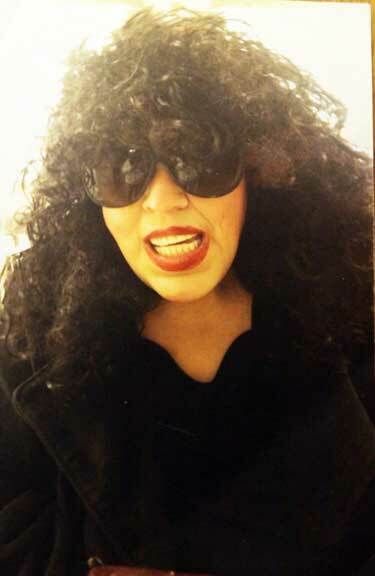 She is another Boston area senior citizen who was medically kidnapped. She died in January due to the withholding of life-sustaining treatment. 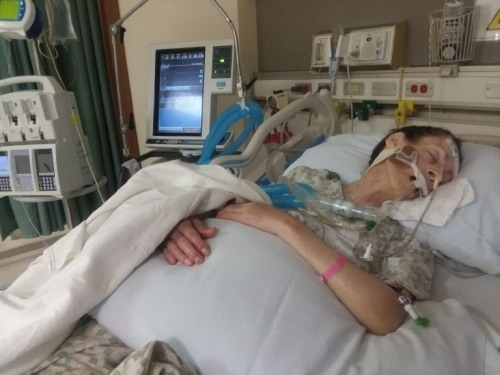 We recently reported the medically-hastened death (euthanasia) of Beverley Finnegan who was medically kidnapped. Attorney Lisa Belanger fought alongside Janet Pidge in the valiant attempt to save Beverley’s life. Her life was taken in January. Lisa Siegel Belanger, Esq., learned about the medical kidnapping of senior citizens when her own father Marvin Siegel was robbed of his liberty in 2011. She and her sister are still fighting for his life and freedom. 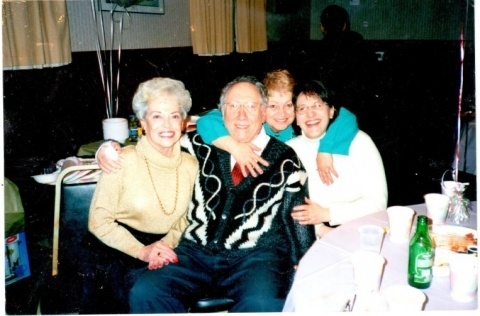 Marvin Siegel with his family before the guardianship. Photo courtesy of family. She is ordained as a Pentecostal minister and attended seminary in her younger days. Even though she became confined to a wheelchair, Mary Frank loved life and she loved her tiny apartment. She could still cook, clean, and take care of herself. She could not, however, go to the grocery store or drugstore by herself. When she found that she was eligible for home healthcare services, she thought that was good. She told Brennan that Minuteman Senior Services contracted a service that sent out someone to help her for 3 hour blocks of time. The first caregiver seemed to be great, but after a year, Mary learned that she had been stealing from her. And, they wanted me to sign a paper that said they were doing three hours. They were getting $18.70 per hour. In my mind, that’s defrauding the federal government. What I found out later was that that money … they were giving kickbacks. That money that they were earning – they weren’t working for it – they were giving kickbacks to Michelle Coakley and Minuteman protective services. I was aghast. I mean, not that I’m ordained [Mary had explained that she was ordained as a Pentecostal minister], but it’s fraud. That’s a clear case of fraud. I thought she was going to strike me. She was outraged and said to sign it, or you’ll be sorry. I didn’t understand the vitriol that was coming out of this woman. I come from a place of peace and love. I didn’t get it. She says that the psychiatrist had been lied to and told that she was sitting in her own excrement and urine and that she threw out her nurse. He realized that “this was bogus.” Even though Coakley reportedly wanted her to be put on the psych ward, she was able to go home. Three weeks later, she was seized again. I said, ‘who’s signing these [psych] papers?’ Because she [Coakley] got somebody who never even saw me – a psychiatrist – to sign the papers. The fraud was unbelievable…and they were so mean to me. They treated me like I was some kind of a criminal. My arms were all full of bruises. They pushed me around. Shortly after, she received a summons for a hearing regarding guardianship, set for November 20. Two days before the hearing, Mary Frank was admitted to the hospital with knee problems that had to be addressed. 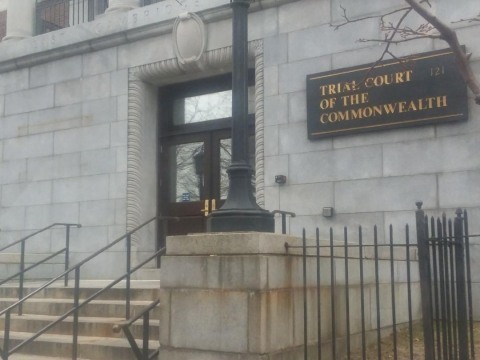 She phoned Mary Kate Connolly, attorney for Minuteman Senior Services, about an extension for the hearing. That call and her call to the court went nowhere, and the hearing took place without her. Without her presence at court, and with no due process, Mary Frank’s freedom was ended. Jewish Family and Children’s Services was appointed as the guardian service for Mary. This is the same agency that was the guardian for the late Beverley Finnegan, the late Alice Julian, and Marvin Siegal. Individuals are assigned as guardians, but they work through Jewish Family and Children’s Services. Lawyers and guardians denied Beverley Finnegan the life-saving treatment her sister wanted her to have. The guardianship cost her life. Photo source. Mary Frank shares the same judge as Beverley Finnegan – Probate Court Judge Maureen Monks. Now, Minuteman Senior Services picks out the guardian. It should be an autonomous guardian, or it should be a family member, or a friend – until you can prove you’re OK. It shouldn’t be somebody who is connected with the people who did this to you. That is exactly what she allegedly did. She put me in the dementia unit. And out of all of this, my prayer is that maybe we can get a state senator or a state rep. to have some hearings at the State House that you have to have an autonomous guardian, [and] that you have to be in that courtroom … that you cannot be put in a dementia unit. I was put in a dementia unit! Everybody there had dementia! Everybody’s in diapers! Nobody could use a phone. Nobody could talk. And the men would come in and take off their diapers and try to get in bed with you naked. 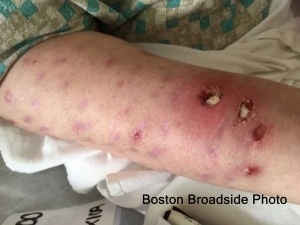 She contracted scabies in the dementia unit at Sudbury Pines Nursing Home. As difficult as it was for her to have the tiny mites burrowing under her skin, the creatures were what finally got her out of captivity in the lock-down dementia unit. She was transferred for an extended stay at a hospital. Photo of Mary Frank’s arm – taken by a Boston Broadside journalist at a visit. Source. Where Are Her Glasses and Dresses? Since then, Mary Frank has been in a couple of different nursing homes. She would love to have some of her things back that she never got when she was seized from her home. She has been told that her things were given to her current guardian, Pamela DeColo, who works for Jewish Family and Children’s Services. Since Mary Frank told her story to The Boston Broadside, someone showed up at her nursing home with a few bags of items and a “tiny” electric wheelchair, too small for her, that was not hers. She is still waiting for her her glasses, dresses, wig, makeup, and HER electric wheelchair. Is It Too Much to Ask for Proper Medical Attention, and a Remote Control? Lonnie Brennan of The Boston Broadside visited her at a nursing home in Marlborough Hills in November to get her recorded statement and again in December to take her a copy of the newspaper. The next time he saw her was in January at the Reservoir Rehabilitation Center in Marlborough, Massachusetts. He learned that she had fallen at the previous nursing home. She was kept heavily medicated before she was finally taken to the hospital, where they discovered that her leg was broken. Mary still needs medical attention. She told Brennan that she had been asking for 2 weeks for a remote control to the TV in her room. She wanted to be able to have at least that tiny bit of control in her life. Brennan told Health Impact News that he called the business office about getting her a remote. Both the business office and “Dan the Handyman” told him that they would take care of it. Lonnie Brennan wrote about Mary Frank’s simple request for a remote control being ignored in the February print edition of The Boston Broadside. 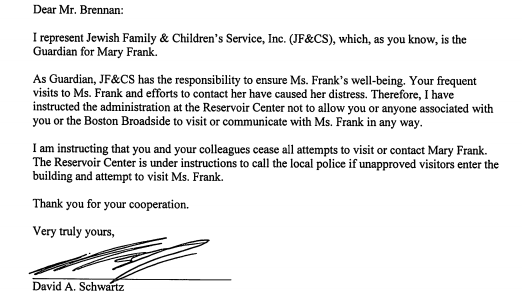 Right after publication, Brennan received an email at 9:28 pm on Saturday, Feb. 3, 2018, from attorney David Schwartz, telling the newspaper editor that Jewish Family and Children’s Services didn’t want him to visit Mary Frank. Letter to Boston Broadside editor. Used with permission. We spoke with Lonnie Brennan, who told us that he saw Mary Frank upon HER request. She initiated contact with him. She wanted to get her story out, and she wants her life back. It is clear that he is not the one who is upsetting her. Because Brennan was not served any papers, the email meant nothing legally. Thus, when Mary Frank called him, again, to tell him that the nursing home staff still had not gotten a remote control for her, he decided to get her one. She had been asking for one for 4 weeks. She also requested some chocolates that she could give to a few of the nurses for Valentines Day who have been kind to her. When he arrived at the Reservoir Center on Saturday, February 10, he noticed people watching him and whispering. Undeterred, he proceeded to take the remote control and 6 boxes of chocolate candy to Mary Frank’s room (4 for nurses, and 2 for her). She welcomed his visit and was “near tears” with joy and gratitude. She looked forward to being able to watch what she wanted (despite the TV being blurry due to her glasses still being missing), and she shared some of the chocolates with a few nurses before the rest were stolen. Lonnie Brennan’s simple act of kindness to a woman suffering alone in a nursing home resulted in the police being called. He learned that there was even a “Wanted” poster at the nursing home with his picture on it. He was not accustomed to being on that side of the police. Before the officers approached him, he reached out to them and introduced himself. Brennan explained about the article and the remote control. He also explained that no papers had been served and that the email had no legal power. The incident was very cordial, and he was not detained. That Friday, the editor was officially served with a “No Tresspass” order. If he visits Mary Frank again, he is subject to a $100 fine and 30 days in jail. His concern is that Mary’s right to have someone visit her has been violated. What will happen to her if no one is allowed to see her and if no one is held accountable? Brennan was a recent guest on the Kuhner Report talk radio show in Boston to discuss this story. 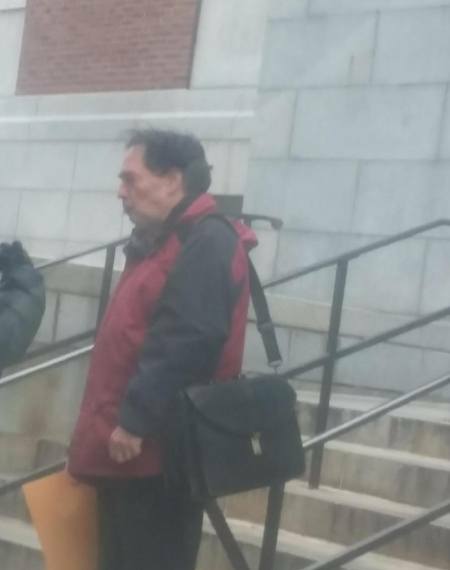 He told Kuhner that DCF, Massachusetts’ Child Protective Services, is nearly a billion dollar business in the state of Massachusetts, and Adult Protective Services is quickly heading there. Rich or poor alike are at risk, said Brennan, from Mary Frank, who just wants her dresses, wig, and makeup back (and her life), to Marvin Siegal, who has had millions of dollars drained out of his estate by guardians. Once they have you, you are better off going to the nearest liquor store and saying, ‘Hey, I’m robbing you.’ Because you’ll get better health care and you’ll get better freedom if you are in prison. I hate to say it. And you’ll have more dignity in prison than you will have – than we have witnessed – in nursing homes. She’s pissed (her words). She just wants her life back. Where Are Her Court Records? 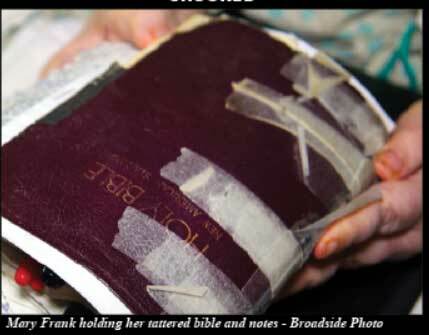 Despite repeated efforts of the court clerks, all of Mary Frank’s files are reported missing. Yes, read that again. The court files are missing for Docket No. MI 3P5348GD. We even went so far as to engage the help of an attorney to attempt to view the files. All the court clerks could do is confirm that, yes, there were more than 16 entries, still logged in their computers, but all of Mary Frank’s court documents are missing. We’ve placed a written “File Search Request” with the Middlesex Probate and Family Court, and asked to be notified should the files ever mysteriously re-appear. Cue the crickets. Where are the files? Have they been scrubbed? Is someone trying to erase Mary Frank? This is the courthouse where life and death decisions are being made, against the will of the people whose lives are decided. Photo courtesy of Lisa Belanger. The main office number for Massachusetts Governor Charlie Baker is 617 725 4005. He may be contacted here. He is also on Twitter. Auditor Suzanne Bump may be reached at 617 727 2075, or contacted here. She is also on Facebook and Twitter. Maura Healey is the Massachusetts State Attorney General, tasked with “combating fraud and corruption” and “investigating and prosecuting crime,” according to the website. Belanger wants to know, “Why not?” It is a valid question. Her office number is 617 727 8400. AG Maura Healey is also on Facebook. Jewish Family and Children’s Services, the common denominator in each of these cases, may be reached at 781 647 5327. They are also on Facebook and Twitter. 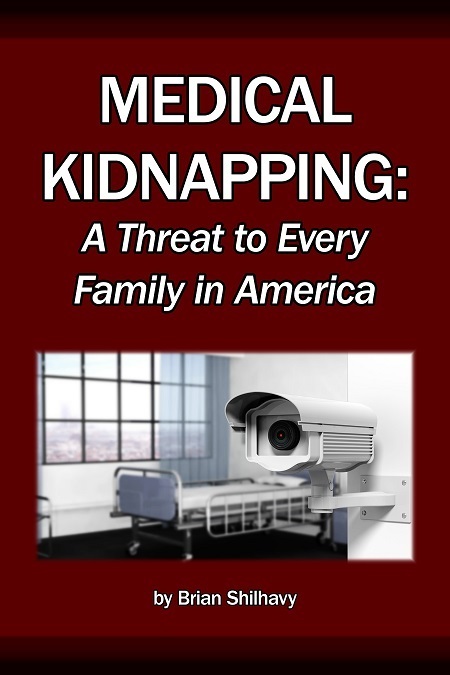 How many more senior citizens will lose their lives or freedom due to being medically kidnapped and placed under their guardianship? Even one is too many.